Last night in Small Group, we read from Ephesians 2 where it says that all of us are corrupt. Of course, this is the one doctrine of Scripture that needs no scientific study. It is readily apparent to anyone who has at least two brain cells to rub together so that a thought may be sparked. Then why does Paul bring it up? He is setting the stage for a different kind of solution to the problem. The world into which he spoke was largely dualistic. Th physical world was evil and corrupt. The spiritual world was good and holy. As a creature of the physical world, all humans were considered inherently corrupt. The solution was to either abandon all physical pleasures and desires through asceticism, or to embrace what Christians call Manichaeism - the idea that since the flesh is irredeemable and the doing of good by a corrupt creature is useless, you can just go ahead and do whatever you want instead and trust that you will be made right when you die and enter the spirit realm. Paul wanted to show another way - the right way - the way of Jesus. We are corrupt, that is true. But we are also created in the image of God, and God loves us (let me use the theologically correct term here) like crazy! And God's love does not simply abandon us to the corrupt nature of a sin-filled world. Back to the Law. This Law, graciously given to sinful, broken people was intended to be used to get us back on the road to faith, hope and love. We have always been made to walk down that road. But we turned the boundary markers of the road into the road itself, and abandoned the actual road of faith, hope and love. We began walking on the railing. 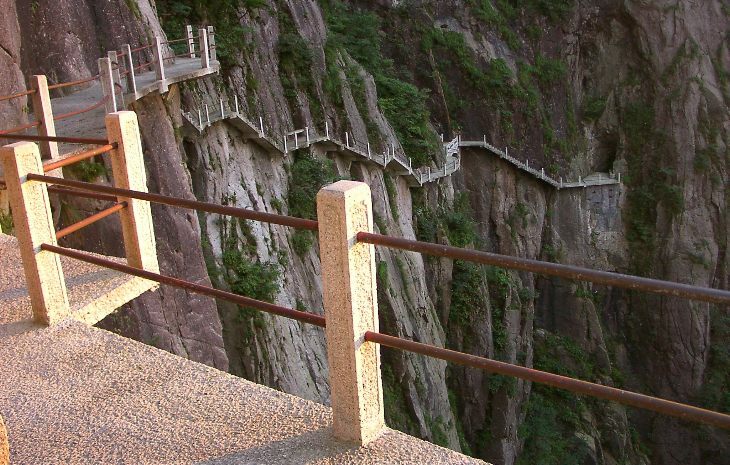 And it's a lot harder to walk a railing than to walk a road. In fact, we cannot and we always fall off on the other side of the rail, and that fall is long, and the landing is hard, and it leaves us broken and completely disabled. I could go on and on, but in short, here is what I think Paul was getting at. Jesus walks the road of faith, hope and love. He does not violate the law as it was intended to be given. He fulfills it by walking the road the law marks off. He let's the law serve it's true function, and invites us to join him. 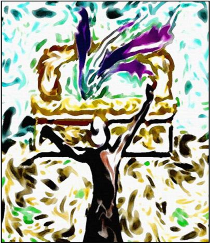 He reaches over the railing, and his arms are long, and his grip is strong, and only he can bring bring healing and breathe new life into our dead souls and put us back on the road of faith, hope and love. 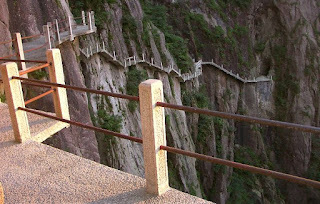 The earlier years of my faith were spent trying to stay on the road by constantly looking at the boundaries or railings to make sure I did not get too close and fall over the edge again. I could not get my mind off of the need to stay inside the rails and not fall over the edge. And I called this spiritual maturity and wisdom. In truth, there were times I did go over the edge and had to deal with what I had done. Because I had fallen, I would sometimes say, "Oh, it doesn't matter. I'm forgiven. No big deal even if I do it again." I had a little Manichaean in me. Other times I would try to avoid falling by holding on to the rail - eyes fixed upon it, never looking up at the one I was following, or the road I was on, or the others on the road with me, or enjoying the spectacular view. I was a member of a very legalistic rail-clinging group. My perspective has changed now. I am no longer obsessed with the boundaries or railings. I am no longer driven by a discontent for where I had been that led me to focus so much of my attention on not going back there. Now, I am driven much more by a love for where I am going as I keep my eyes on Jesus and follow in his footsteps, doing what he does, loving who he loves, speaking the truth that he speaks, challenging what he challenges, encouraging who he encourages, serving who he serves and ...well, you get the idea. I think this is what Paul was getting at. We are not to forsake the law, but to allow it to do what it was intended to do, and that is mark the road of faith, hope and love along which Jesus invites us to walk side by side with him. His grace makes this possible. May you be driven to grow in your faith, less and less by the discontent over where you have been, and more and more by the love for where Jesus is taking you.